Angela Hanson DeGrado '64 has faced significant pain and loss in her life. Since her teenage years, she has suffered from the crippling affliction of arthritis. Then in 2001, her husband of 33 years died suddenly. Her strong faith, study of God's word and love for writing poetry helped heal her anguish. A grief recovery group gave her invaluable support, and Angela met her second husband, widower Jim DeGrado, there. They began to encourage others who had lost spouses by working with church-based grief groups. They also spent several years producing an inspirational book, "Wrestle the Wind: Permission to Grieve, Provision to Heal." The volume blends Angela's verse with Jim's photography and scripture that sustained them in the midst of their loss. Angela transferred to Westmont after two years at the University of Arizona, and she felt like she had come home. Not only did she grow in her faith at Westmont, but she made deep, life-long friendships. "People accepted me and loved me, and I felt secure," she says. A psychology and education major, Angela taught elementary school, established a preschool at her church, did private tutoring, and worked with high school students in foreign-exchange programs. She formed strong friendships with several students and their families and still visits them overseas. Jim, a retired graphic artist, spent 25 years as creative and advertising director for a national company based in Chicago. In retirement, he pursues his passions for computer graphics and photography. 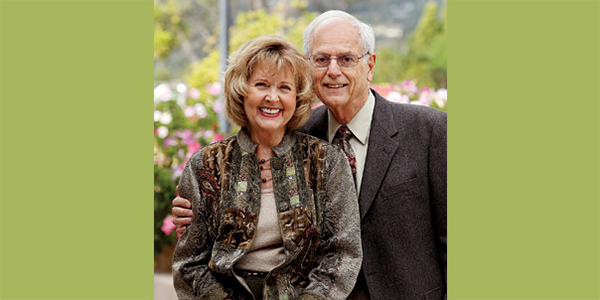 The DeGrados spend winters in Palm Springs, Calif., where they are active in the life of their church and are involved with other civic and cultural organizations. Angela and Jim established a gift annuity with Westmont and belong to the Wallace Emerson Society. "We want to be part of an institution that produces excellence in so many areas: music, art and every subject," Angela says. "We're excited to support Christian education - and to receive secure, monthly income as well." Jim adds, "Together we seek a deeper walk with God and situations where we can be mirrors of his love and grace." Reprinted with permission from the fall 2009 issue of the Westmont College Magazine. For more information about gift annuities including lifetime income and tax benefits, please contact the Office of Gift Planning at (805) 565-6058 or giftplanning@westmont.edu.